Calgary Flames & Carolina Hurricanes Trade: Who's the Winner So Far? Flames & Hurricanes Trade: Who’s the Winner So Far? It was the trade that sent waves throughout the hockey world. 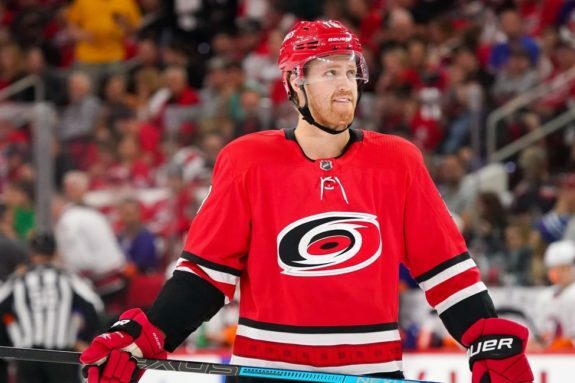 On June 23, 2018, the Calgary Flames and Carolina Hurricanes made a blockbuster deal that sent forward Elias Lindholm and defenceman Noah Hanifin to Calgary in exchange for defenceman Dougie Hamilton, forward Micheal Ferland and blue chip prospect Adam Fox. We’re just past the midway point of the 2018-19 National Hockey League season, so which team has won the trade so far? I’m going to do an in-depth look at what each player has done so far this season to determine the answer. Lindholm has been nothing short of spectacular so far this season playing on a line with Johnny Gaudreau and Sean Monahan. The trio has seemingly found instant chemistry since day one and it is constantly on display night-in-and-night-out such as this goal against the Winnipeg Jets on Dec. 27. Lindholm’s statistical increase of a new career high in goals with 20 to go along with his 28 assists is noticeable, but each of Lindholm, Gaudreau and Monahan own a Corsi For percentage just under 60 and the 24-year-old Lindholm has greatly improved his plus/minus from his previous career high of minus-two in 2016-17 to plus-25 this season. 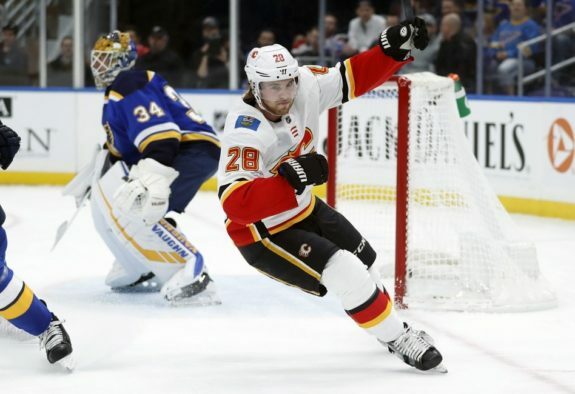 Lindholm has also played a key role on the Flames’ improved power play and penalty kill units which currently rank sixth and 19th, respectively. Mostly known for his smooth skating and two-way play, Hanifin has filled in quite nicely in the Flames’ top-four, playing with shutdown defenceman Travis Hamonic. While the 21-year-old left-handed Hanifin may not post eye-popping numbers like Hamilton’s 17 goals, he is strong defensively, makes a great first pass on the breakout and his 21 points are only 11 points back of his career high of 32. Last season, Hanifin started 63.1 percent of his starts in the offensive zone, but this season his numbers have leveled out to 50.4 percent in the offensive zone compared to 49.6 percent in the defensive zone. While those numbers may be a bit high due to the fact that he’s playing with Hamonic, Hanifin has shown he’s a trusted member of the Flames’ top-four and can be relied upon to generate offence while also playing key defensive minutes. Hamilton’s departure out of Cowtown was a bit surprising to many, considering he posted one his best statistical campaigns of his young career last season with 17 goals and 27 assists for 44 points. So why is a 25-year-old, right-shot offensive defenceman already on his third team? There have been many stories, untrue or not about Hamilton not fitting into the Flames’ dressing room and the team was looking for better chemistry. So far this season, he has five goals and 13 points which puts him on-pace for one of his worst seasons statistically in his young career. In his defence, he has regularly been a slow starter before picking up his play in the second half of the season, so look for that to once again be the storyline when the season comes to an end. 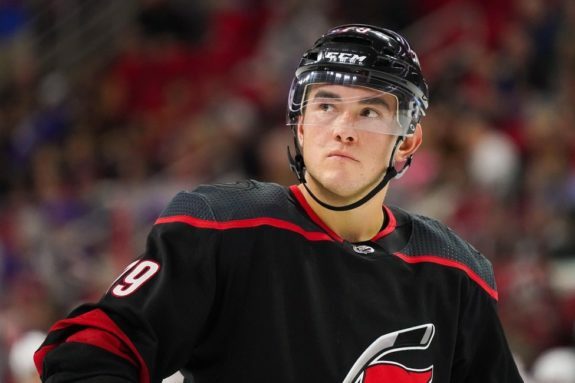 The wrecking ball that is Ferland got off to a quick start this season, scoring six goals in the Hurricanes’ first nine games before missing some time due to a concussion. Even though he only has 19 points in 33 games, he brings a mix to the lineup that few players possess in this day and age of the NHL with his ability to hit, fight and score goals and could play a large role in how this trade could possibly work out in favour of Carolina, if they are able to keep him. There are reports throughout social media that Ferland is asking for a long-term deal at over $three million per season and whether or not Carolina signs him or trades him will play a big role in who wins this trade. The x-factor of this deal could be Fox. With the Harvard Crimson of the NCAA, Fox has posted five goals and 15 assists in 12 games. He is a solid two-way defenceman with the potential to play in Carolina’s top-four in the future due to his play in both ends of the ice. At this point in time, the Flames are the overwhelming winners. Lindholm himself has outscored both Hamilton and Ferland with his 48 points compared to the 15 goals, 30 points and minus-12 rating put up by his Carolina counterparts. Add in Hanifin’s totals, the Calgary duo partnered for 23 goals, 70 points and a plus/minus rating of plus-31 and they’ve outscored the Hurricanes’ duo by 40 points. The addition of Fox to the lineup as well as whether or not Ferland is wearing Hurricanes colours next season will play a role into who wins this trade down the line, but through the midway point of the season, the Flames win this trade.